The Pawnbroker (1965) is one of the first Hollywood films to deal with a Holocaust subject. It is the story of Sol Nazerman, (played by Rod Steiger) a survivor of Auschwitz, who runs a pawnshop in Harlem. He is, as he says, “surviving” but he has become a frozen shell, unable to allow for human connection. He supports the remnants of his family but feels little connection to them. People come to his pawnshop, but he feels no connection to any of them, either. He has taken on an assistant, Jesús Ortiz (Jamie Sanchez) a young man who is attempting to turn his life around. The film follows Sol through a crucial few days in which his defenses gradually fall apart, as the tragedies in his past crowd in upon him. It was a bold and insightful decision to portray the Holocaust not as a coherent story, but in the splintered memories of a survivor. In the film, the Shoah is not an event of history, it is a personal cataclysm. We catch a glimpse of what was, and receive a hint of the Sol’s agony. No special effects, no explicit torture scenes, could convey the horror as well as these shattered bits shot in black and white, criss-crossed with the wire cages of the pawnshop. Steiger’s performance is excruciating, and it is no surprise that it was nominated for an Oscar. Not every survivor of the camps was a Sol Nazerman, and the film makes that clear. Every individual who survived the camps had his or her own private horror. That fact sometimes gets lost in the grand sweep of blockbuster films like Schindler’s List or the historical detail of documentaries like Shoah. What the Pawnbroker reminds us is that while the evil of the German death machine may have been impersonal, the tragedies it inflicted were highly personal. 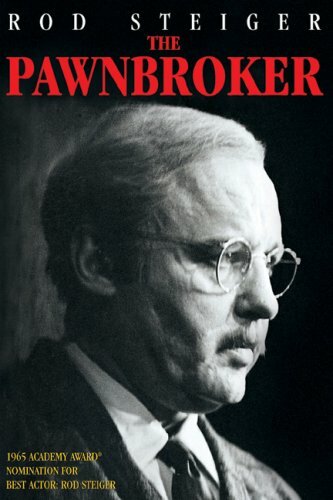 Video Bonus: The original trailer for The Pawnbroker is available on the TCM website. This entry was posted in United States and tagged Anti-Semitism, Drama, Holocaust. Bookmark the permalink.